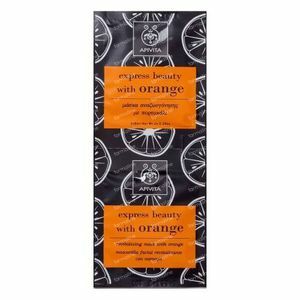 Apivita Express Revitalizing Mask With Orange FREE Offer 2x8 ml order online. Revitalizing mask with cream-gel texture, suitable for all skin types. - Coenzyme Q10 and vitamins C and E rejuvenate the skin and provide antioxidant protection. - Wheat germ oil and organic jojoba oil offer in-depth nourishment and hydration. - Organic honey extract, organic shea butter, panthenol and hyaluronic acid have an intensive hydrating and smoothening effect. - Organic orange essential oil invigorates and hydrates, giving the skin a natural glow and radiance. - In the Express Beauty line, APIVITA has replaced water with green tea infusion for its antioxidant action. A revitalizing and nourishing mask with orange extract to boost dull skin's radiance. - Apply a rich, even layer of the mask on cleansed skin, avoiding the eye area. Leave on for 10 minutes and then rinse well. - Use once or twice per week, or even daily.